If you're not sure on the correct steps to back up iPhone files to a computer using iTunes, here we have a full guide for you, including the detailed steps to create iTunes backup, fixes to any problems during iPhone backup using iTunes and an easy way to backup iPhone without using iTunes. There are two kinds of iPhone users, those who lost data and those who will. Unfortunately, many users haven't started backing up data until they lost the important files. There is enough emphasis on the necessity of data backup and today we're not going to continue the topic. Today we will show you the full steps on how to backup iPhone to iTunes correctly as the reason that users don't back up is because that they don't want to mess things up, especially when using iTunes backup. What to do if iTunes won't backup iPhone? How to Backup iPhone Data to iTunes? What Does iTunes Backup Include? 1. Launch iTunes and connect iPhone to the computer. After that click Continue button in iTunes and also authorize the computer on iPhone. 2. Click the device icon next to the left drop-down menu and then click the Summary button from the left sidebar. Scroll down and find Backups section. 3. Check the box This computer below iCloud. You can also encrypt the backup, which will back up more data of iPhone, including your account passwords, health, and HomeKit data. Check Encrypt iPhone backup box and it will ask you to set a password. Remember, if you forget your password, you're not able to restore the password-encrypted iTunes backups. After you set the password, iTunes will start to backup iPhone to iTunes automatically. Then you only need to wait for the process to finish. If you have set the password before and start to backup data from this step, it's very easy: connect iPhone to the computer > open iTunes > click device icon next to the left drop-down menu and then Summary > click Back Up Now under Manually Back Up and Restore section > click Done. If iTunes backup is so easy, why are so many users daunted by iTunes? * iTunes could not backup the iPhone because an error occurred. A message comes up telling you that iTunes won't back up your device because of an error but without identifying what the error is. This is really annoying. * iTunes could not backup because an error occurred while reading from or writing to the iPhone. * iTunes won't recognize iPhone. "When I connect my iPhone to my computer, iTunes doesn't recognize it, help!" * iTunes backup is corrupted or incompatible and therefore you can't restore the data you backed up to your device. * iTunes backup won't complete or get stuck. 1. Check the USB connection and try another USB port. 3. Go to the iTunes backup location and rename the old iTunes backup folder to force iTunes to create new backups. 4. Check, update or disable the security system. 5. Check for software updates of iPhone, computer and iTunes. 8. If all these steps or tricks won't let your iTunes work, try the third-party iPhone backup tool below. This part is for those who have trouble to backup iPhone using iTunes and who need to protect their music, photos, videos, etc. in an easier way. 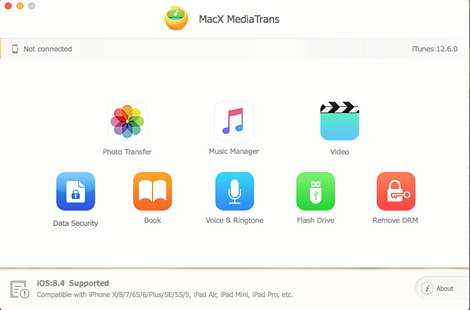 The tool you need is MacX MediaTrans, which is able to backup videos, photos, songs, playlists, ringtones, books, iTunes purchases, audio, other data from iPhone to computer as an alternative of iTunes. The data backup speed is super fast (far faster than iTunes) and the whole process is stable without issues. Step 1: Connect iPhone to the computer via a USB cable and run the app. From the main interface, select the data type you want to backup like Photo Transfer. Step 2: In the popup window you can see all your photos listed here with the album categories showing on the left sidebar. To backup all the photos from iPhone to computer, check the Select All box on the top toolbar. Or click Ctrl button and select multiple photos you'd like to backup. Note: If you want to restore your backups, simply click the Import and add the media to your device. One-click to backup videos, photos, music, iTunes items, books, other data from iPhone to computer. 2 What's the Difference Between iCloud Backup and iTunes Backup?